Figure 1.11 A body in a variety of orbits around the Sun. at its maximum speed. It is then slowed down by the Sun's gravity as it climbs away from the Sun, and has its minimum speed as it passes through aphelion (a). The mathematical details show that under the three conditions the precise shape of the orbit is elliptical with the Sun at a focus (Kepler's first law) and that the increase in speed with decreasing solar distance gives the equal areas law (Kepler's second law). Consider the body now in the circular orbit 2 in Figure 1.11. This orbit has the same perihelion distance as orbit 1, but the body is now moving more slowly at p than it was in orbit 2, and so it does not climb away from the Sun. It still accelerates towards the Sun in that its motion is always curving towards the Sun, but its overall motion is just right to keep it at the same distance from the Sun. Consequently its speed in its orbit is constant, and its acceleration is entirely in its change of direction. If a body had no sideways motion then it would accelerate straight into the Sun. Now consider the body with a speed at the perihelion distance of p greater than that of the body in orbit 1 in Figure 1.11. □ What would be the orbit were the speed at p only slightly greater? In this case the body would climb slightly further away at aphelion - the semimajor axis would be greater. If we increase the speed further then Newton's laws predict that we will reach a value at which the body climbs right away from the Sun, never to return. This threshold is met in orbit 3 in Figure 1.11. This is a parabolic orbit. 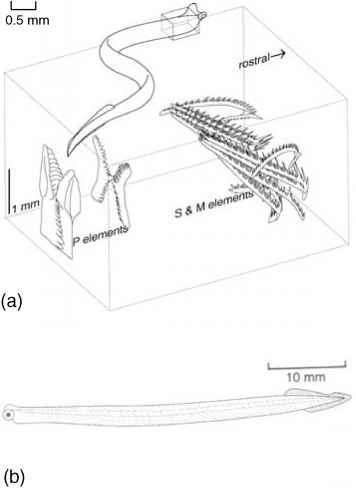 It is not a closed curve - the two arms become parallel at infinity. Orbits with even greater perihelion speeds are even more opened out, and one example is orbit 4. These are hyperbolic orbits. At infinity, the two arms of a hyperbola become tangents to diverging straight lines; the greater the perihelion speed, the greater the angle between the lines. Parabolic and hyperbolic orbits are called unbound orbits, whereas an elliptical orbit is a bound orbit. Are there any Solar System bodies in unbound orbits? Yes there are. Table 1.4 shows that the orbital eccentricities of two of the comets listed are indistinguishable from 1, a value that corresponds to a parabolic orbit. Two of those listed are in hyperbolic orbits. If a comet is in an unbound orbit then, unless its orbit is suitably modified to become bound, e.g. by a close encounter with a planet, it will leave the Solar System. Also, unless its orbit has been modified on its way inwards, it must have come from beyond the Solar System. Comets are a major topic in Chapter 3. For Kepler's third law (P = ka3/2) we have to consider bodies in orbits with different semimajor axes. You saw earlier that the a3/2 dependence is the combined result of an increase in the distance around the larger orbit, and a lower orbital speed. This lower speed is explained by the decrease of gravitational force with distance (Newton's law of gravity, equation (1.5)) and the corresponding decrease in acceleration, a result derived in detail in standard texts. Such texts also show that, under the conditions 1 and 2 above, Newton's laws give where M0 is the mass of the Sun and m is the mass of the other body. This is not quite Kepler's third law. □ What further condition is needed? To get Kepler's third law 4^2/G(M0 + m) must be a constant for the Solar System. With m being the property of the non-solar body, this condition is met if m is negligible compared with the Sun's mass. This is condition (3) above. In the Solar System Jupiter is by some way the most massive planet, but even so is only 0.1% the mass of the Sun. Therefore, condition (3) is met to a good approximation, and Kepler's third law is explained satisfactorily by Newton's laws. From the orbital data for the Earth in Table 1.1, calculate the mass of the Sun. Work in SI units, and note that 1 year = 3.156 x 107s. Repeat the calculation using the data for Jupiter's orbit. State any approximations you make, and whether your calculated masses seem to bear them out. Conditions (1)-(3) in Section 1.4.4 are met only approximately in the Solar System, and because of this, complications arise, as follows. 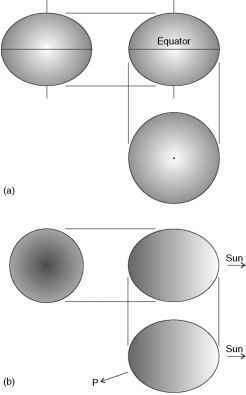 Consider a single planet and the Sun, as in Figure 1.12(a). You can see that they each orbit a point on a line between them. 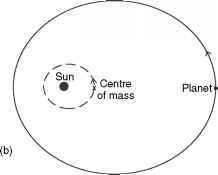 This point is called the centre of mass of the system comprising the Sun and the planet. For any system of masses the centre of mass is the point that accelerates under the action of a force external to the system as if all the mass in the system were concentrated at that point. Thus if the external forces are negligible then the centre of mass is unaccelerated. By contrast both the Sun and the planet accelerate the whole time because of their orbital motions with respect to the centre of mass. In Figure 1.12(b) the same planet is shown in its orbit with respect to the Sun. This orbit is bigger than the two in Figure 1.12(a) but all three orbits have the same eccentricity and orbital period. Kepler's first two laws apply to the planetary orbit with respect to the Sun, as in Figure 1.12(b), and are not invalidated by the non-negligible planet's mass. where r0 and rp are the simultaneous distances of the Sun and planet from the centre of mass at any point in the orbits, and mp and M0 are the masses. Though we shall not prove this equation, it has reasonable features. For example, the greater the value of mp/M0, the further the centre of mass is from the centre of the Sun. In Figure 1.12 mp/M0 = 1/4, corresponding to a planet far more massive than any in the Solar System. □ Where is the centre of mass if the mass of the planet is negligible compared with the solar mass? It is then at the centre of the Sun. 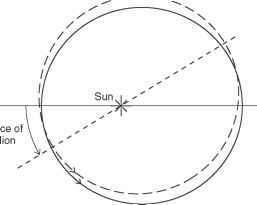 Figure 1.12 A planet in orbit around the Sun. (a) Motion with respect to the centre of mass. (b) Motion of the planet with respect to the Sun. we can calculate that the centre of mass of the Jupiter-Sun system is 740000 km from the Sun's centre. Thus, if Jupiter were the only planet in the Solar System the Sun's centre would move around a nearly circular orbit of radius 740 000 km - not much more than the solar radius. The effects of the other planets are to make the Sun's motion complicated, though the excursions of the Sun's centre are confined to within a radius of about 1.5 x 106km. Figure 1.13 Departures from spherical symmetry in a planet due to (a) rotation and (b) the tidal force of the Sun. is because it is so much closer than the Sun that the differential force it exerts across the Earth is greater than the differential force exerted by the Sun: the gravitational force of the Sun is almost uniform across the Earth, whereas that of the Moon is less so. The importance of departures from spherical symmetry, however caused, is that they enable one body to exert a torque - a twisting - on another body. For example, a planet in Figure 1.13(b) in the direction P is slightly closer to the left end of the distorted planet than to the right end. It therefore exerts a greater overall gravitational force to the left than to the right, and so there is a torque. It can be shown that orbital changes result from such torques. □ List some gravitational forces on a planet other than the gravitational force of the Sun. Most obviously there is the gravitational force exerted by the other planets. The planets have much smaller masses than the Sun, and are relatively well separated. Therefore, from Newton's law of gravity (equation (1.5)), it is clear that the combined gravitational force of the other planets is small, giving only slight effects on the planet's orbit. In contrast, a comet can approach a planet fairly closely, in which case the comet's orbit will be greatly modified. Planetary satellites also have an effect - it is the centre of mass of a planet-satellite system that follows an elliptical orbit around the Sun, in accord with Kepler's laws. The planet and each satellite thus follow a slightly wavy path. As well as other gravitational forces there are non-gravitational forces. For example, when a comet approaches the Sun, icy materials are vaporised - it is these that give rise to the head and the tails. But they also exert forces on the comet, rather in the manner of rocket engines, and considerable orbital changes can result. Because of additional forces and a lack of spherical symmetry the planetary orbits are therefore not quite as described by Kepler's three laws. However, the departures from the laws are usually sufficiently slight that we can regard the orbits as ellipses in which the orbital elements change, usually slowly, and often chaotically, i.e. without pattern, although the semimajor axes, eccentricities, and inclinations are usually confined to narrow ranges of values. The values given in Table 1.1 apply in 2006, but the values, almost to the precision given, will be unchanged for many decades. The values for a,e, and i in particular will not wander far from the values given, for millennia, except perhaps for the least massive planet Pluto. The word 'usually' has been used several times in the preceding paragraph, which raises the question 'what about the exceptions?' In Section 1.4.6 we consider exceptions arising from the gravitational interaction between two bodies orbiting the Sun. (c) the Sun entered a dense interstellar cloud of gas and dust. The gravitational interaction between two bodies orbiting the Sun gives rise to what are called orbital resonances. These can greatly affect the stability of an orbit. There are two types of resonance, mean motion resonances and secular resonances. Here we present a minimal account, sufficient to serve later needs. Figure 1.14 A 2:1 mean motion resonance (mmr) between Jupiter and an asteroid. (a) The perihelion of the asteroid occurs when it is in line between the Sun and Jupiter (probably stable). (b) The aphelion of the asteroid occurs when it is in line between the Sun and Jupiter (probably unstable). so the effect of the tugs builds up, probably leading to ejection of the asteroid from its orbit. Many mmr effects are seen in the Solar System, as you will see in later chapters. The other type of resonance is the secular resonance. 'Secular' in this context means a long-term interaction. Thus, rather than looking at the instantaneous interaction between two bodies in orbit around a star as in Figure 1.14, we consider the averaged interaction over a long period, In effect, it is as if each body has been smeared out along its orbit and the gravitational interaction is between these rings. There is a great variety of secular resonances. Figure 1.15 illustrates just one type for the case of two bodies orbiting in the same plane. For the sake of clarity the orbit of each body has been replaced by its semimajor axis. Note that the interval between each configuration corresponds to many orbital periods. The gravitational interaction between the two bodies causes the semimajor axis of each of them to move around in the plane of the orbit (shown in grey). This means that the perihelion of each body also moves around - this is called precession of the perihelion. This is a general phenomenon when there are more than two bodies orbiting a star. But in this particular case you can see that the angle between the semimajor axes oscillates around zero, and that it never gets large. This confined difference is an example of a secular resonance. In this case it enhances the stability of the orbits. Other secular resonances lead to instability. Later chapters outline examples of secular resonances in the Solar System. Precession of the perihelion does not always correspond to a secular resonance, as you will see in the next section. From the orbital periods of Neptune and Pluto in Table 1.1, deduce whether these two planets are in a resonance, and, if so, whether it is a secular resonance or a mean motion resonance. Figure 1.16 Precession of the perihelion of the orbit of Mercury. The two orbits are separated by 2000 years. system fixed with respect to the distant stars) is through an angle of 574 arc seconds (arcsec) per century (3600 arcsec= 1°). The effect of all the other planets, and of the slight departure of the Sun from spherical symmetry, leaves a discrepancy of 43 arcsec per century. This discrepancy (at rather less precision) was a great puzzle when it was identified in the nineteenth century, and it was not accounted for until 1915 when the German-Swiss physicist Albert Einstein (1879-1955) applied his newly developed theory of general relativity to the problem. General relativity is not a modification of Newton's laws, but a very different sort of theory. Fortunately, for most purposes in the Solar System, the far simpler theory of Newton suffices. Einstein's theory accounts for the observed rate of precession of the perihelion of Mercury to within the measurement uncertainties.